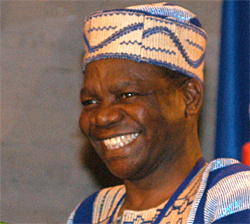 29-09-2003 3:30 pm UNESCO’s General Conference, currently holding its 32nd session, has elected Michael Abiola Omolewa, Ambassador and Permanent Delegate of Nigeria to UNESCO, as its President for the next two years. He replaces Ahmad Jalali of Iran. A graduate in African History (1964) and History of Administration (1973) from the University of Ibadan (Nigeria), Mr Omolewa has led a distinguished academic and administrative career, focused mainly on the development of adult education both in Nigeria, at the country’s leading universities and various state education authorities, as well as in the international arena. Mr Omolewa has served on UNESCO’s Executive Board since 1999. He is also the Vice-President of UNESCO’s International Bureau of Education (Geneva, Switzerland), a member of the Executive Board of the International Standing Conference on the History of Education (ISCHE) and a member of the Government Advisory Council of the International Baccalaureate Organization. He is on the editorial boards of several leading education journals, including the International Journal of Higher Education, and has served as a consultant to numerous international aid agencies. The General Conference, UNESCO’s supreme governing body, brings together all of the Organization’s Member States (currently 190) every two years. It determines UNESCO’s Programme whose implementation is overseen by the Executive Board. The 32nd session of the General Conference opened today and will last until October 17.